A very special and interesting trip which connect you up with history, culture and art helping you collect knowledge and priceless values. Knossos is the main center of the Minoan civilization and it was discovered in 1878 by merchant Minoas Kalokairinos. Knossos is placed on the top of the hill of Kefalas village, surrounded by olives trees, vineyards and cypress trees and it is located 5 km southeast of Heraklion, by river Kairatos (presently known as Katsampas). According to tradition, it was the seat of King Minos and capital of the state. There is a connection between the palace of Knossos and the myths of the Labyrinth with the Minotaur and Daedalus and Icarus. The trip starts, and first stop is the Monastery of Arcadi known all over the world thanks to its important participation during the liberation wars of the island. After that, you will visit the museum of the ancient Elefthernas, which is the first museum of archaeological site in Creta, and according to excavation researches there are findings which are connected directly to the dawn of Greek culture and Homer. 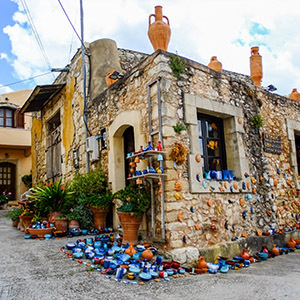 The last stop is Margarites village and the pottery workshop “TSIKALARIO” where you will discover how to combine the four elements of nature – soil, water, wind and fire -, and how the create traditional jars of high quality and aesthetics. The most important thing is that you’ll have the chance to use your imagination in order to make your own piece of pottery! Do you want to swim in one of the most beautiful beaches of Europe? If yes, then, welcome to paradise, at the beach of Elafonisi with its exotic beauty, its pink sand and its transparent water.